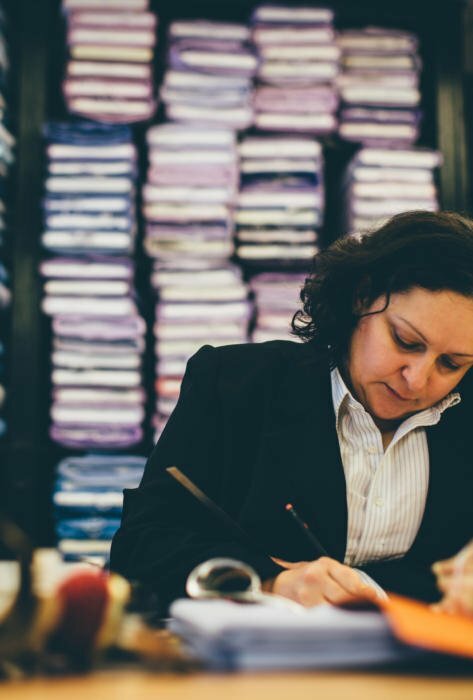 There are many reasons to commission a bespoke piece of clothing. I think the decision I made earlier in the year to order a bespoke shirt at Charvet, however, was the first time I have done so out of pure curiosity. I used to have shirts made by Turnbull & Asser. The fit was good, but both the style and the make were lacking. Style because English shirtmakers don't understand how to make a collar that rolls open without a tie; and make because those same makers do nothing but the cutting by hand. Long-time readers will be familiar with this journey. I now use three Italian makers that visit London - Simone Abbarchi, Luca Avitabile and D'Avino. They present three very good options, ascending in price directly in proportion to the amount of handwork they use. I'm happy with that set up, but have always been intrigued by Charvet. Because I have seen some superbly fitting Charvet shirts on friends, and because I am such good friends with the inimitable Jean-Claude Colban (below). Selecting that cloth was perhaps the most enjoyable part of the whole experience. The shirtings section of the Charvet building is a treasure trove, with bolts of cottons and linens stacked shoulder-high around the whole floor. It's worth the commission on its own. I was looking for a thinly striped shirt to introduce some variety into my plain-blue and plain-white collection, and we picked an unusual one with a touch of fading to the edge of each line - extremely subtle. The fitting was a month later, again coincided to fit with a visit to Paris. The back was a little short, so it was sliced open just below the yoke, and taped back together with sellotape - leaving a centimetre-wide gap. The same was done on one side too, leaving things a little bit draughty. Then various scribbles were drawn all over the shirt with a biro (it was only a white fitting shirt). Similar things to those you'd have on a tailored suit were marked in pen rather than chalk - my shoulder blades, my seat, the hollow below my collar bone. Finally, a large pair of shears was taken to the collar. We had spent quite a long time discussing which collars suited my face at the initial meeting. I wear exclusively spread collars with ties, but it was agreed that we needed a slightly smaller, slightly more pointed one to suit my face shape. This was trimmed down further at the fitting. Two trims were made, each followed by a brief conversation, with no more than a millimetre removed each time. Very small margins here. It will be interesting to see how the final shirt turns out. I would surprised given this level of attention to detail if the fit is not very good. But it may still lack the ability of the Italians' lightweight fusing to work both with and without a tie (even though we picked the lightest weight of collar lining at Charvet - being selected above). You can follow the discussion on Charvet bespoke shirts, Paris by entering your email address in the box below. You will then receive an email every time a new comment is added. These will also contain a link to a page where you can stop the alerts, and remove all of your related data from the site. 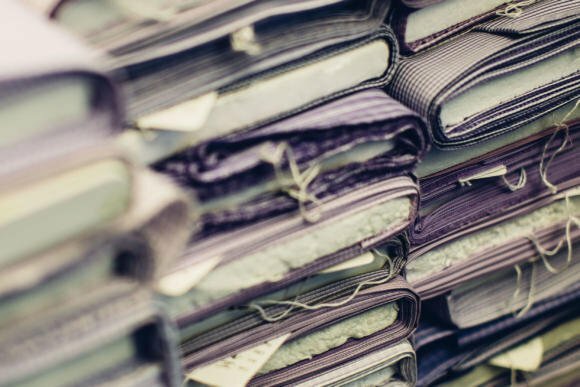 Great article and one very relevant to me and my shirt issues, I’ve been struggling for a while to get decent English bespoke shirts. I must have had more than 10 made up and only 2 have ever really been satisfactory. so of the stuff that comes back from the factory has just been plain embarrassing. I didn’t even try one on it looked so bad. I’m thinking of going to see Luca next time he is in London (do you know when) if I can time it with a trip down south. one of the very few problems of not living in London is access to tailors etc. Do Charvet ever visit the UK? Hi. 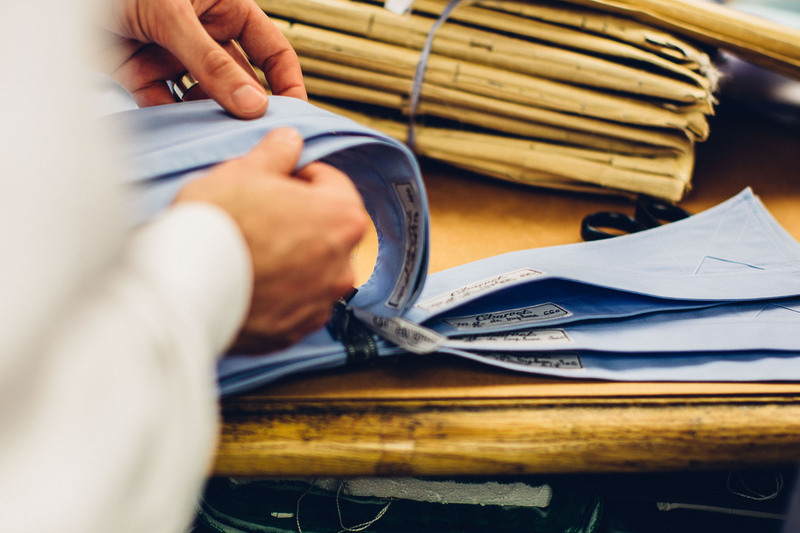 Do you know what is the whitest fabric that Charvet carries for a shirt? 3 years ago I went there and had the info, but unfortunately lost it!! I believe Luca is next in London 7-9 July but do check. 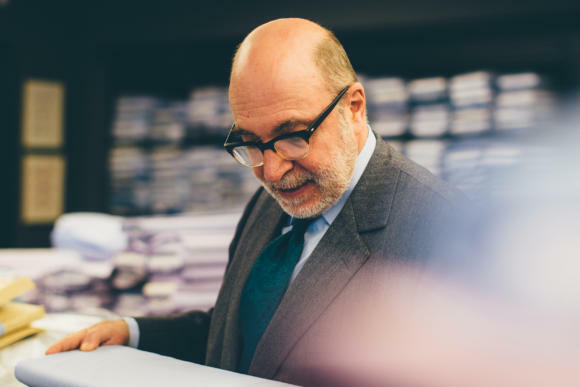 I haven’t tried Luca but its been a bit of a journey to find a shirtmaker in london that gets what I want, which is like most Englishmen , a shirt style for all seasons with a collar that looks great with a tie and sits open under a blazer. I’ve tried Cad and Dandy MTM but the fit was just off and lost all confidence in them. After that E. Willis and T & A bespoke was my next visit and the shirts are good with a tie but the fit was a little fuller than I would have liked and I think its because the collar is what is called a non fused which I lead to believe doesn’t work great without a tie. I then was recommended Guy Field and finally stubbled across and have been very pleased with the results thus far, just placed my second commisoning though I’ve been told with Italy closing for August will have to wait a little longer for them! Would you mind telling us the cost of the shirt please? Is it significantly higher than their RTW range, which is already very expensive, when compared to some of the italian makers who you mention above? 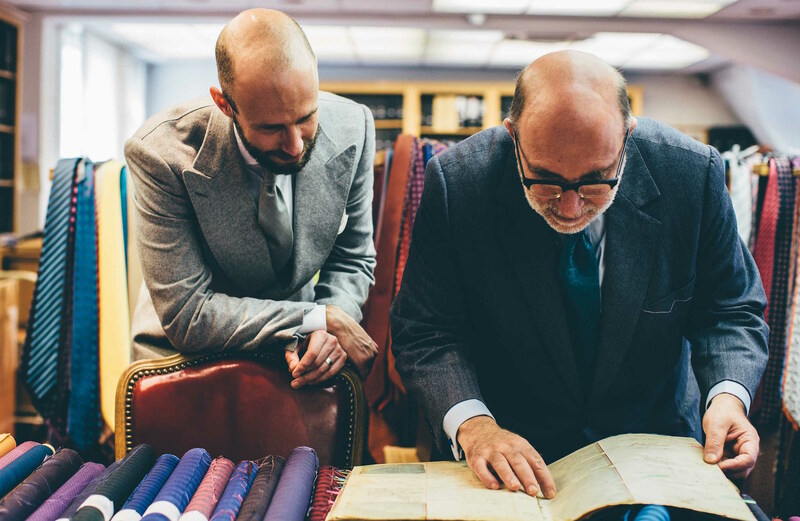 Simone Abbarchi and Luca Avitabile are affordable options for bespoke shirts, certainly for those living in London who are able to visit them when they are in the country . However , for the rest of us there is a growing number of online made to measure shirt makers. Which of these , if any would you recommend ? Bearing in mind that a shirt is often the most affordable and accessible item of made to measure tailoring for most men . I know why English (talking about London here) shirt makers have a minimum order due to the costs of pattern making etc, but at some point will they have to review this practice. I would never want to ever commit to a shirt maker with such a large initial order. Especially as I refine the pattern each time I order. I am now 6-8 orders in with Simone/Luca combined. looking at how many others like me form a queue every time they are over having no minimum order clearly helps. I am sure T&A are not short of orders but if the travelling Italians are growing in client numbers how long before orders dwindle. Totally agree. Particularly given the likelihood that the first batch of shirts will not fit as well as those in subsequent orders. I’d give Ede & Ravenscroft a try. They do not require a minimum order and also offer their bespoke shirting service outside London (Oxford and Edinburgh). What is the starting price for a bespoke shirt from Charvet? 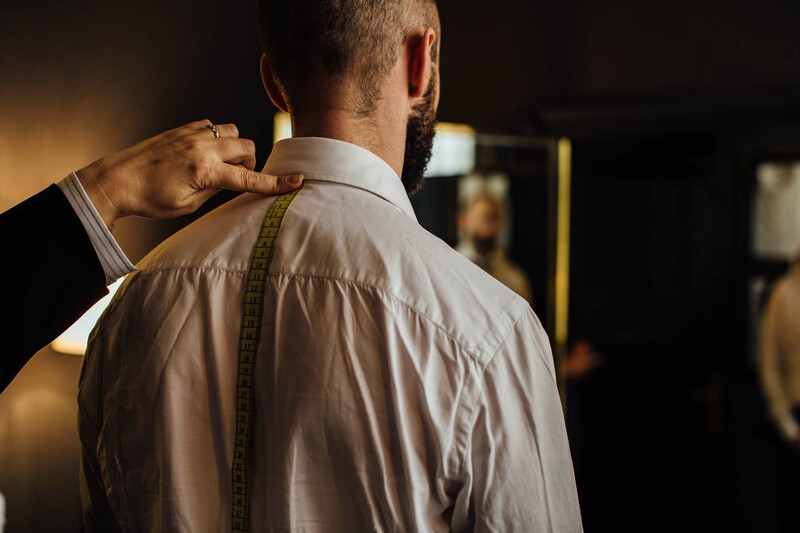 Bespoke shirts start at € 580, made to measure at € 460. It surprises me quite how much it is every time. Wow. That’s almost twice the price of Turnbull and Asser. Very eager to see how your shirt turns out! I’m curious as to your thoughts on shirt maintenance. When I buy shirts they often last for about a year before any fraying or underarm wear has taken it’s toll. How do you battle those elements given the price point at Charvet for example? Exactly. At twice the price of T&A you’d expect perfection. my firm hired quite a good photographer to shoot “business portraits” to be used in future pitch decks and proposals and stuff. I was wondering if you could advise on what suit+tie combination to wear. Would dark grey suit + solid burgundy knit tie + white square could work well? How about more patterned ties (think small Hermes animals that look like geometric patterns from afar)? How about going a completely different route with a fantastic Eton suit? Looking forward to hear your advice. From what I understand I can do 1-2 outfits and probably either portraits or plan américain, i.e. whole upper body above the waist. A lot depends on your industry, what would be seen as too smart or too casual. Generally though, the clothes should be pretty much anonymous in something like this. I’d advise no pocket square, a dark suit and printed/woven silk tie, not a knit. As always, I enjoyed your observations, this time about Charvet. I am a great fan of theirs and have been buying shirts from then since the ’70’s. One of the great features of Charvet is their building and each floor is a discovery, such as entering the pyramids. Seeing their selection of shirt materials is worth going there, whether you buy one or not. Thank you for sharing your experiences with others who may not have had the opportunity to visit Charvet in Paris. How would one set up an appointment? How many fittings are required and can one fit everything into one week’s time? Lastly, for shirts, what are the tangible benefits of going bespoke over MTM? You can set up an appointment by calling Charvet, one fitting is required, but no it cannot be done in a week. Bespoke v MTM is a big question for another time! whats the minimum time needed for bespoke? To me shirts are more important than jackets or suits. I believe a lot of finance guys can relate. Here’s why: Sure, I wear a suit everyday. But the moment I get to my desk I take the jacket off to hang it on my chair’s hanger where it will sit for the 10 or so hours that I work. Everybody does it. Literally nobody ever wears their suit jacket. And nobody ever wears a tie, except on their first day, when meeting a non-finance client, and (if they are lucky enough to know in advance) on their last day. Now for what it’s worth it’s implicitly decreed that only white, very light blue, white with very light blue patterns are acceptable shirt colors. So literally everybody wears exactly the same. Sure, you could be “that guy” who wears a tie, or a jacket but you would stand out for all the wrong reasons. In a way it would be perfectly fine, just as it was perfectly fine to play tennis in a soccer outfit, or squash in a speedo. It would be equally weird though. So, long story short when everybody dresses the same fit becomes even more important. I’m not yet fully convinced on why i would pay ca. 600 EUR for a Charvet shirt when I can get something fitting almost as good as made to measure from fantastic fabric for about half that price, but I guess I will get there. I mean maybe 5 or so years ago I considered Brooks Brothers “3 for 199 shirts” the pinnacle… So I guess it’s a journey. are the English shirtmakers simply not interested in learing how to do the Italian style collar? There must be a fairly large crown in the UK which likes the way Italian collars behave and so adding it to the line-up as a shirtmaker would increase their customer base. By the sounds of it you may have learned something new about what collars suit your face on this trip? Are there are any general tips on this you can share from your experience to date? Hello Simon, I would like to know what determined your choice of collar. Myself I do not wear ties and am not fond of button down (too many buttons), so I wear point collars. But lately seeing so many men wearing spread collars even without a tie I wonder if the point collar might have become a little outdated. And do you think Oxford cloth should only be used for button down Shirts? USE DEODORANT ALUM STONE, is ecological, antiallergic, ECONOMIC AND WORKS. I follow and I do keep your posts, of course because they’re worth of it. Thank you. I own SuMisura Mestres de Medida in Lisbon. Ever been? We are MTM specialists ( not makers) and we provide our clients with ( so we pursuit) the best that money can buy. I personally invite you to our atelier if sometime you pay a visit to the most beautiful sun light in Europe. If and when for sure it would be a pleasure to bring to your eyes and expertise our work because I strongly believe that our shirt making and fitting would match your expectations and I do really hope it would surpass your expectations. Humble as I can be regarding the brands you mention that I fully respect, I am just being bold, hope not rude, so that sometime you could give us the pleasure of booking your visit, if not more, for a nice chat around something we both love. Keep up the good work and long live Permanent Style! Great article Simon, also great timing! I will be traveling to Paris in mid-August and I am planning to visit Charvet to have a bespoke shirt made for myself. I live in Los Angeles, California and I love bespoke clothing. My current favorite bespoke shirt maker is Anto of Beverly Hills. They have a similar rich history as Charvet. I look forward to have the Parisian bespoke shirting experience and to compare the two brands side by side. When could we expect a final review, Simon? I got demi-measure at Charvet about 4-5 years ago and thought pretty much everything is machine made (to very high quality). I am very impressed as to how the buttons hold up. They are so tightly shanked, I assume they are placed by some fancy machine – none of my other hand shanked shirt buttons have held up so well. I think there are many tasks that machine does much better than man. People can be better at handling tasks that are non-routine. BTW, you have a typo in paragraph 12. You probably mean “yoke” not “yolk”. Thanks. Yes, it is a machine that shanks the buttons, T&A have the same one. They also use thread with a little stretch in it to hold tightly. I agree of course on handwork – it is only functional around curves on the shirt, when you are trying to create shape or work in excess, such a the collar and the sleeve attachment. Ok, maybe this fits better here… Can I bother you with a technical question? I am facing the problem that the arm of my tailored dress shirts wrinkle/drape quite a lot in the area of the inside of my elbow (not sure what’s the anatomically correct term for this). Also this area (lower arm, just below the elbow) feels quite tight. Now, my tailor is convinced that this is “normal”, however I find this compression of material (think: accordion of fabric between my elbow and wrist) a bit strange. I’m suspecting that the arm may be cut too long and that since the cuff is very tight the material naturally compresses were it can. My alternative theory is that the arm may be cut too tight as I never faced that problem in my more American looking shirts. To sum up I really like my shirts to fit tight, but I’d prefer to have less wrinkles. What should I tell my tailor? Hello Simon you mentioned that you post the review about the Charvet shirt soon. When can we expect it. I am very curious about it. Have a great day. Sorry Matt, it won’t be for a few weeks. There are some big projects launching at the moment, with the trunk show here in London just the first one. I have had MtM shirts by Charvet back in 1999. I did find that the collar did not look too good without a tie, the fit was too loose in my opinion. The overall style and fabrics too conservative. I then had a better experience with Halary: better fabrics choice, better collar, for a good third cheaper. Same tendency to cut the shirt too loose though. I also enjoyed the fact that I could bring them a shirt (those Gucci TF era ones) and have a few made from it. And Patrice Halary is a charming person. I am curious to know what you think about checked and striped shirts? I almost never see you wear them yourself? Did your receive your Charvet shirt? How does it compare with Luca Avitabile or D’ Avino? I did. I’m sorry I haven’t had a chance to review it yet. But in short, no, it’s probably not worth the money. Great fit, but no hand work in the make, and really only designed for wear with a tie. When are you planning to visit Paris again? There is one very talented tailor that I believe you should meet, Jean-Luc Rambure. Looking forward to her from you. It may sound a bit bold from my side but could you please let me know when you start to plan your visit? I would be more than pleased to introduce you. My sole interest is to introduce you to a new generation great yet unknown, “grand mesure” independent tailor. Hi Simon, I was told that a lot of brands in the UK get shirts made at Emanuel Berg in Poland. By all accounts they seem to make great shirts, I was wondering if you had tried any, and also if their was an equivalent manufacturer in Italy that made MTM and Bespoke shirts for other brands. I am visiting Italy soon and would be keen to check a factory out. It’s been a while since this post, and I just wonder how this order has progressed so far. I second that. When will we get the review? It’s coming, I promise. Took photos last week, so hopefully early next week. I am writing you for the first time and needed your guidance in understanding the best fusing brands for shirts, I am currently using Wendler . Thank you for your efforts towards men’s fashion. I noticed that my shirt collars (especially white and pale blues) start yellowing after a period of not wearing them. I’m wondering if you experience this issue and what would be a way to mitigate this. It’s rather unsightly.